For industrial enterprises looking for more productivity and more sustainability, the platform simply brings a vast array of solutions (through connectivity, transparency, traceability, data sharing and management, the capacity to prevent issues through asset optimization and management). 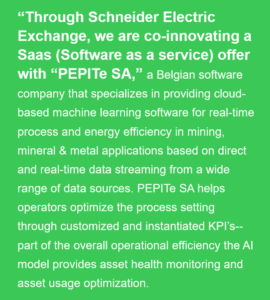 Indeed, in addition to third-party solutions co-innovated by Schneider Electric Exchange communities, the ecosystem includes our EcoStruxure™ solutions, which provide access to Schneider’s open, interoperable, IoT-enabled system architecture and ecosystem of experts such as best-in-breed technology partners. This is huge. I will like to be more informed.